New Guinea impatiens are a great choice for a long-blooming flower for a sunny spot in your garden. Like their shade-loving cousins the common impatiens, New Guinea impatiens form small clumps and hold their many flowers above their foliage, where they make a colorful display. No deadheading is required to keep them repeat blooming for months. 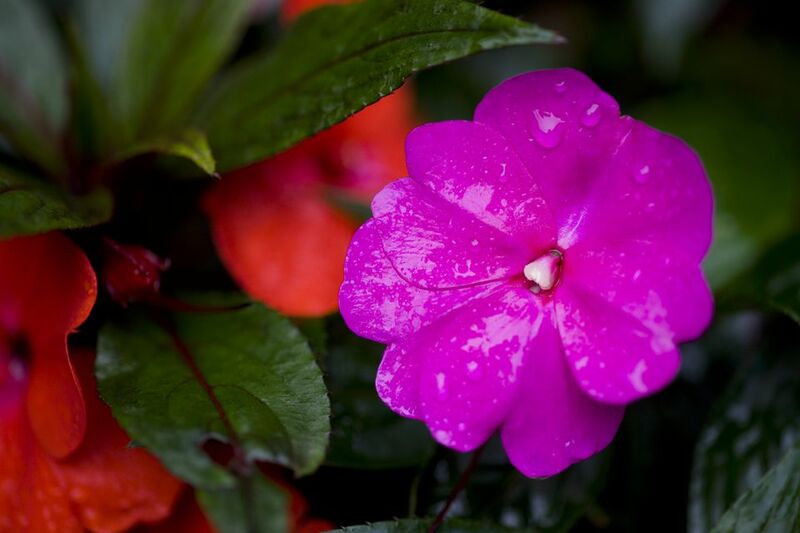 With few pests or problems, New Guinea impatiens offer low maintenance and high performance. Their pointed oblong leaves stay attractive throughout the season and are glossy, dark green, burgundy, or variegated. The flowers are similar to but larger than the flowers of common impatiens. They have five thick petals and produce lots of nectar, attracting butterflies. New varieties are introduced yearly. Most gardeners grow New Guinea impatiens as an annual plant, purchasing them in pots to transfer to the garden. Expect your New Guinea impatiens to start blooming early in the season, if they aren't already in bloom when you buy them. They will bloom continuously if they are getting enough sun and water. Except for water and food, there really is no maintenance needed. You should keep the area weeded, so there is less competition for water, but that's about it. They will require a bit more care and feeding when grown as perennials or houseplants. Don't expect them to be as lush or to flower as profusely in the short days of winter. New Guinea impatiens make wonderful container plants. Having them in pots lets you get an eye level view. They are also terrific for edging a walkway or the front of a border. If you want to mix it into your border, plant them in a large block, for impact. Sun exposure depends on how hot it is and how much moisture the plants receive. New Guinea impatiens do best in at least a half day of full sun. If the soil is dry or temperatures are extreme, they will need up to a half day of shade or they may not bloom as well. The best outdoor location would have morning sun and afternoon shade, such as in an eastern exposure. New Guinea impatiens like a slightly acidic soil pH in the range of 6.0 - 6.5, but they are not terribly particular about it. They will need a well-draining soil, that holds moisture long enough for the roots to soak it up. New Guinea impatiens are heavy feeders, so add a good amount of organic matter to the soil at planting time or before. Plant at the same level they are in their pots. Once in the ground, give them a good drink of water to help them establish. These plants need regular water. Do not let them remain dry for extended periods or they will stop blooming, decline, and potentially die. New Guinea impatiens are not drought tolerant, but you don't want them sitting in wet soil for long periods or their crowns could rot. Avoid watering them from the top, if possible. Do not plant outside until all danger of frost has passed, preferably with night temperatures above 45 F. They prefer day temperatures of 70 to 85 F and night temperatures of 55 to 65 F. New Guinea impatiens are usually planted as annuals. Since New Guinea impatiens bloom their little hearts out all season, they will need some supplemental fertilizer. Give them a dose of your favorite water-soluble food every three to four weeks. Since New Guinea impatiens are hybrids, most varieties cannot be grown from seed. They are either sterile or will not grow true to seed. However there are a few that have stabilized, and seed is available if you want to give them a try. Luckily plants and seedlings are readily available and there is much more variety if you purchase them as seedlings. You could even bring them inside for the winter, as houseplants. They are also easily grown from cuttings. It's hard to recommend varieties for annuals that are constantly being hybridized. You never know if this year's introduction will be available again next year or if there will be an even better, improved version of it. However, if you'd like to grow your New Guinea impatiens from seed, the Divine Series is readily available in single colors or mixes and it comes in shades of white, pink, lavender, orange, and red.